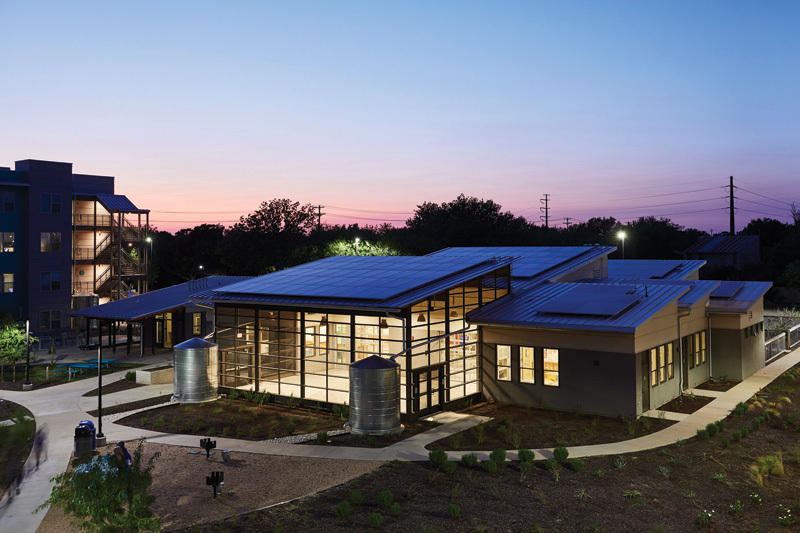 Now in its second year, the Austin Green Awards recognizes inspirational green building, landscape, and infrastructure projects in Central Texas. The 2017 judges included Christine Skaglund of Ten Eyck Landscape Architects; Lance Hosey, FAIA, of Harley Ellis Devereaux; Chris Krager, AIA, of KRDB; and Greg Mella, FAIA, of SmithGroupJJR. Award winners were honored at a celebration held at the Waller Ballroom in Downtown Austin on October 25. For more information about the program, visit atxgreenawards.org. 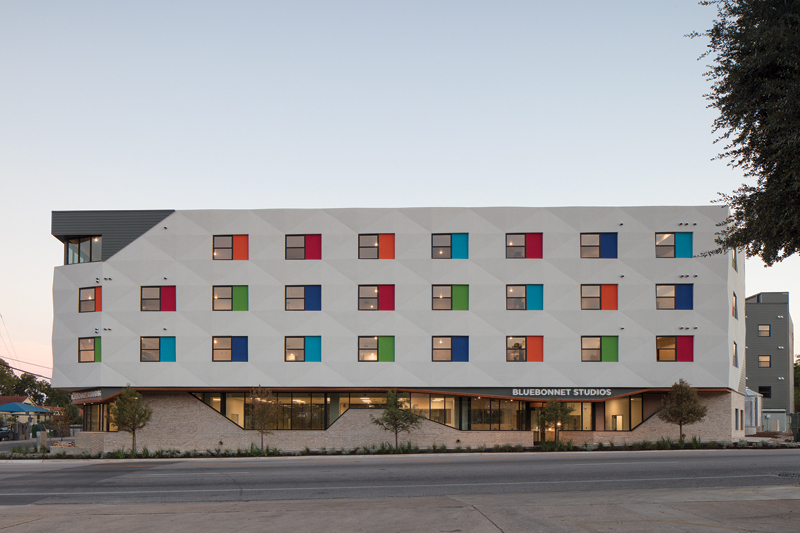 The first fully inhabited “net zero” commercial building in Austin, the Learning Center hosts after-school and summer learning programs for children, and offers financial coaching, exercise and nutrition classes, and assistance with health insurance enrollment for adults. 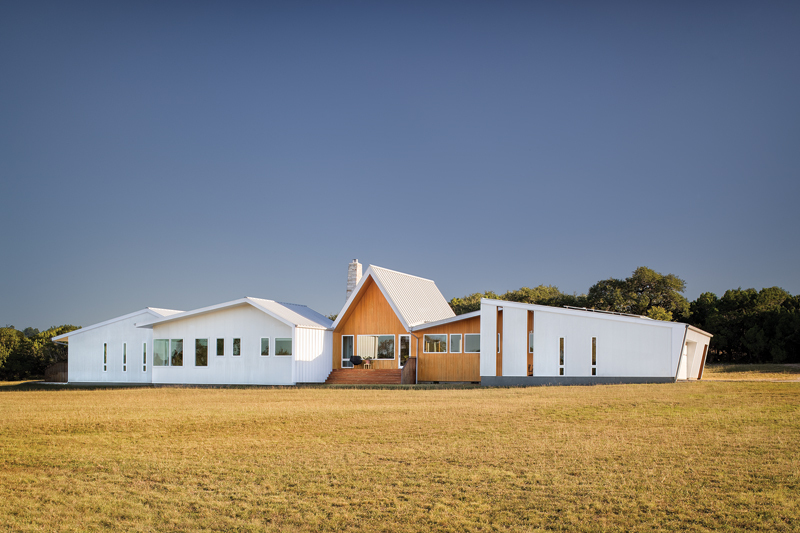 Located on a meadow in Wimberley, this private residence is a prototype for a sustainable rural community, featuring off-grid water and energy systems, daylit spaces, straightforward materials, and outside spaces that welcome community gatherings. This affordable, multi-family infill project, composed of 107 efficiency units, is located on a heavily trafficked street in south Austin. The high design quality, coupled with a social and education program available to residents, engenders a sense of pride and stewardship, yielding enduring benefits. 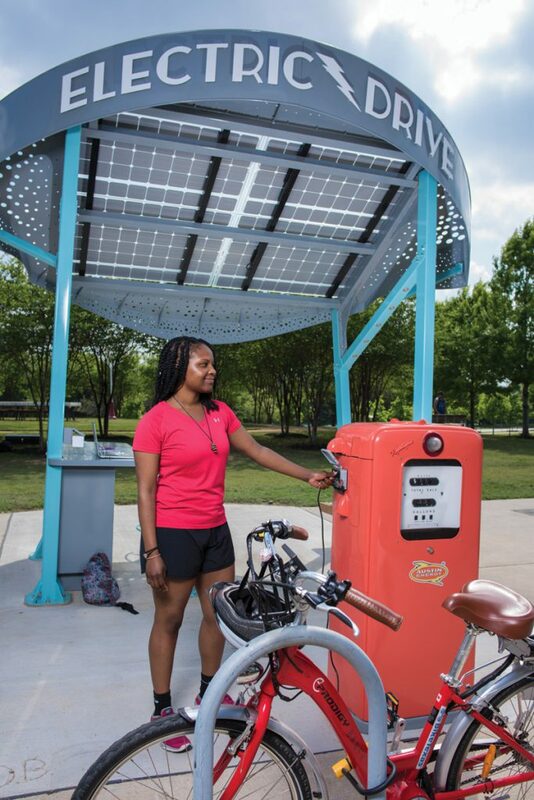 Electric Drive is the new name for West 2nd Street, celebrating its innovative approach to mobility’s future in downtown Austin and featuring an ADA-accessible solar kiosk, designed to recharge mobile electronic devices and electric bicycles, with a visual display showing solar production and CO2 reduction.